March 11, 2014 -- Links International Journal of Socialist Renewal -- Socialists in Asia-Pacific pledge support for Venezuela’s socialist revolution, a year after Chavez’s death. March 5 marked one year since the death of Venezuela's president and revolutionary Hugo Chavez. An outspoken fighter for the oppressed in Venezuela and Latin America, the loss of Chavez is still felt keenly by socialists and anti-imperialists globally. But the Bolivarian revolution that Chavez led is a mass movement of millions of people that lives on in the barrios and workplaces in Venezuela. This process, led by the government of President Nicolas Maduro, is facing fresh attacks by right-wing forces backed by the United States. The recent violent protests by a minority that has repeatedly been defeated at the ballot box has caused widespread destruction and terror. Along with at least 20 deaths and hundreds of injuries, public buildings and government-run, pro-poor social missions have been attacked by opposition protesters, at the estimated cost of up to 10 million bolivars. The international media has presented this fascist violence as a peaceful democracy struggle that has been repressed by a dictatorial Maduro government. This turns reality on its head. Despite all the ideological weaknesses, the left in Nepal remains a mass force that is not seen in any other country of the region. November 28, 2013 -- Viewpoint (Pakistan) -- I was present as an International Observer to the November 19 general elections in Nepal, invited by the National Election Observation Committee (NEOC). Polling was unexpectedly peaceful. Interestingly enough only 226 out of the 601 Constituent Assembly seats are directly elected. That is, the majority of seats are elected through a proportional voting system. More than 70 per cent of Nepal’s eligible voters participated in the November 19 vote despite an election boycott and transportation strike by a coalition of 33 parties, led by the CPN-Maoist. It is clear that the boycott strategy failed. Just eight days after the election -- when I am writing these lines -- we can begin to view the shape of the new assembly. 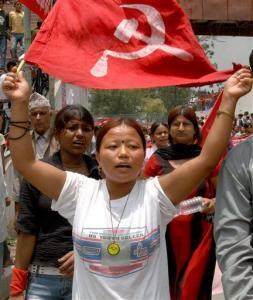 What is shocking is that right-wing forces have been able to advance despite the fact that three main communist parties -- Communist Party of Nepal (United Marxist-Leninist, United Communist Party of Nepal (Maoist) and CPN-Maoist -- still remain a major force in Nepal and enjoy the sympathy of the majority. March 6, 2013 -- The Socialist Alliance in Australia expresses its deepest sympathies with the people and government of Venezuela on the death of Companero Hugo Chavez Frias on March 5. His passing is a huge loss for all peoples, across Latin America and the globe, struggling for a world free of inequality, exploitation and oppression. It is testament to Hugo Chavez’s great leadership that, while mourning his death, we are also confident that the Bolivarian Revolution and the new movement for socialism of the 21st century that Chavez inspired will be continued by the mass of people, to whom he worked so hard to give power. Many fighters of the People's Liberation Army have joined the new party. More coverage of Nepal HERE. June 23, 2012 – Links International Journal of Socialist Renewal, an earlier version of this article was posted at International Viewpoint – The Maoist party, the Unified Communist Party of Nepal (Maoist) -- UCPN(M), has entered a crisis and has split. On June 16-18, 2012, the radical faction of the party held a national convention and decided to organise the first congress of a new revolutionary party, named CPN–Maoist, to be held on February 12, 2013. One-third of the central committee members of the UCPN(M) have joined the new party. Alex de Jong looks at the background to this development. 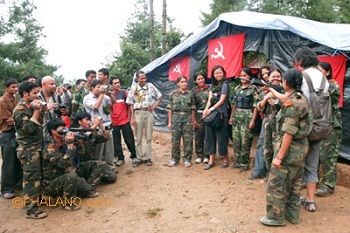 March 20, 2012 – Links International Journal of Socialist Renewal -- While Nepal is very different from the Philippines in many key aspects of the country’s economy, society and politics, nevertheless the experience of the Maoist movement in that country holds valuable lessons for the Philippine left – both the Maoists and the non-Maoist revolutionary movements. In Nepal we see the successful implementation of a people’s war strategy, followed by and combined with the development of an insurrectionary urban mass movement, which resulted in the overthrow of a feudal monarchy, the declaration of a federal democratic republic, the establishment of a constituent assembly and a successful intervention in elections in 2008 by the United Communist Party of Nepal – Maoist (UCPN-M). Links International Journal of Socialist Renewal/Green Left Weekly-- El primer ministro, Madhav Kumar Nepal, ha argumentado que las balas, los explosivos y otras municiones ya no constituyen “armamento letal” con tal de que sea usado para “el adiestramiento y otras obras relacionadas”. STOP PRESS: Nepal PM agrees to step down May 30, 2010 -- Morning Star -- Nepal's three main parties have held talks to try to hammer out a new coalition government after the prime minister finally agreed to resign to avert a political crisis. Madhav Kumar Nepal of the Communist Party of Nepal -- Unified Marxist-Leninist (CPN-UML) said that he would step down in a last-minute bid to secure the support of Maoist MPs for a government Bill to extend parliament's term. It was due to end on May 28, which would have left the country without a functioning legislature. The Unified Communist Party of Nepal -- Maoist (UCPN-M) and its supporters have been protesting both in parliament and on the street for months to press Mr Nepal to go The UCPN-M controls most seats in the assembly and their support was required to get the two-thirds majority to pass the Bill. CPN-UML leader Pradeep Gyawali said: "Leaders of the Nepali Congress, the CPN-UML and the Maoists are now in deep discussions on how to take Friday's agreement forward." Marching to defend Maoist barricades against right-wing provocations. May 11, 2010-- jedbrandt.net -- The largest mobilisation of human beings in Nepal's history brought hundreds of thousands of villagers into the capital Kathmandu for the May 1 protests – and the entire country to a standstill. On May 1, this city belonged to the members and supporters of the Unified Communist Party of Nepal (Maoist). From Kalinki to the Old Bus Park, packed buses poured into the city. Every seat and aisle was filled. Young men perched on the roofs. Bags of rice, lentils and vegetables were stockpiled in the schools, wedding halls and construction sites that served as makeshift camps for the protesters. The following joint statement of solidarity -- initiated by Socialist Alliance, Australia -- has been signed by a number of left and progressive organisations in the Asia-Pacific region. If your organisation would like to sign on, please email international@socialist-alliance.org. May 3, 2010 -- jedbrandt.net -- From here in Kathmandu the monarchy ruled this diverse mountain nation for 200 years. This is where the national elite live, with its political parties, banks and walled compounds. But the streets now belong to the people, and it is this "people's power" movement that they fear. Kathmandu is chaotic on a normal day, but for May 1 the Maoists mobilised at least 500,000 people to the steets with both discipline and revelry. The Janandolan III, or popular uprising, they promised is here. We positioned ourselves by one of the 18 gathering points for the May 1 events. Each of the gathered marches then moved through the streets to Martyrs' Field in the Kathmandu city centre. May 1, 2010 -- May Day -- saw millions of people mobilising around globe to oppose attacks on workers' rights, reverse the degradation of the environment, defend the rights of oppressed peoples and migrants and -- as in Nepal, Venezuela, Cuba and Bolivia -- to make, extend or defend unfolding revolutions. In Nepal, Jed Brandt reports that between 500,000 and 1 million people flooded the streets on Kathmandu to demand the resignation of the government. The massive mobilisation -- called by the Unified Communist Party of Nepal (Maoist) and the Young Communist League -- is the prelude to a general strike that begins May 2. May 1, 2010 -- Late into the night, after a long May 1 in Kathmandu: I just left the Radisson Hotel where negotiations had been going on. Dr Baburam Bhattarai, a top leader of the Unified Communist Party of Nepal (Maoist) and its negotiating team, came out the doors to say that the three negotiating parties have not reached an agreement. The general strike is on. Others in attendance at the negotiations included the Congress party and the [pro-capitalist] Communist Party of Nepal (United Marxist Leninist). The hated, isolated current prime minister M.K. Nepal will not resign. Bhattarai was sharp and direct. Since they will not make way for a national unity government, the agitation will increase tomorrow with a national general strike to topple the unpopular and unelected government. The May 1 rally today was well over 500,000. April 21, 2010 — JedBrandt.net — There are moments when Kathmandu does not feel like a city on the edge of revolution. People go about all the normal business of life. Venders sell vegetables, nail clippers and bootleg Bollywood films from the dirt, cramping the already crowded streets. Uniformed kids tumble out of schools with neat ties in the hot weather. Municipal police loiter at the intersections while traffic ignores them, their armed counterparts patrol in platoons through the city with wood-stocked rifles and dust masks as they have for years. New slogans are painted over the old, almost all in Maoist red. Daily blackouts and dry-season water shortages are normal for Nepal’s primitive infrastructure, not the sign of crisis. Revolutions don’t happen outside of life, like an asteroid from space – but from right up the middle, out of the people themselves. March 21, 2010 -- UNITYblog -- Ben Peterson is a young Australian socialist who spent four and half months in Nepal last year. Ben is crossing the Tasman for a speaking tour of New Zealand from March 21-26. Ben was kind enough to answer some questions for UNITYblog about his experiences in Nepal. On May 28, 2008, an elected constituent assembly declared Nepal’s centuries-old semi-feudal monarchy finished. As Nepalese people celebrated in the streets, the Himalayan country was declared a republic. October 26, 2009 -- This interview first appeared on the web site of the Britain-based World People's Resistance Movement (WPRN). It has been posted at Links International Journal of Socialist Renewal with permission. Baburam Bhattarai is a politburo member of the Unified Communist Party of Nepal (Maoist) and was finance minister in the former Maoist government led by Prachanda. For background to this interview, visit HERE.